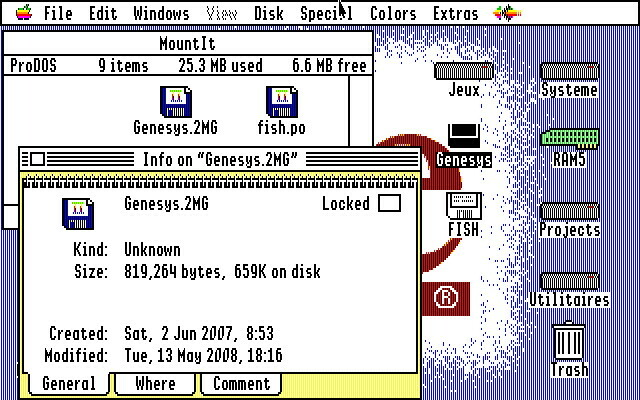 Original software of August 2009 on Apple IIgs by Antoine VIGNAU and Olivier ZARDINI. Update 2/MAR/2011. Mount your disk image files files directly under GS/OS, just like another volume. MountIt 1.4 is a new Permanent Init File devoted to handling different disk image files (.DSK, .PO and .2MG) of any size (from 32KB to the maximum RAM available), only ProDOS based. Up to sixteen volumes can be added to the system. MountIt mounts volumes as read-only if the original disk image file is locked. Otherwise, the disk image file is mounted as read/write and the following operations can be performed: read, write and format. MountIt is not ProDOS 8 compatible. A switch to P8 will remove any drivers from memory. The package contains an Installer program which will copy MountIt to your startup disk. Note that the source code of the program can be found under the Documentation folder.